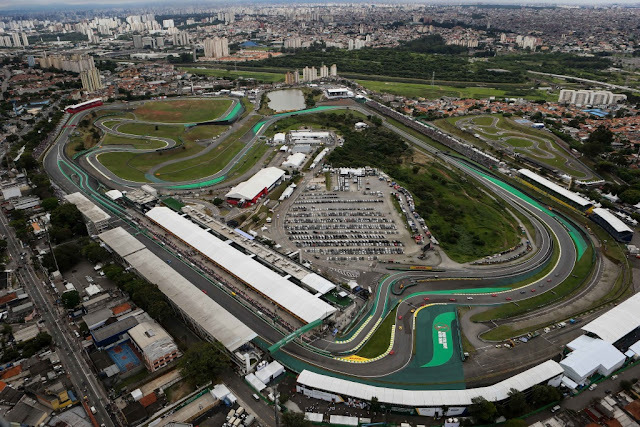 Cerulean skies bathed the paddock in unrestricted sunlight, the brilliant glare of the Brasilian firmament bouncing pointillist light off every available surface in stark contrast to yesterday's qualifying session, announcing a brand new day had dawned. 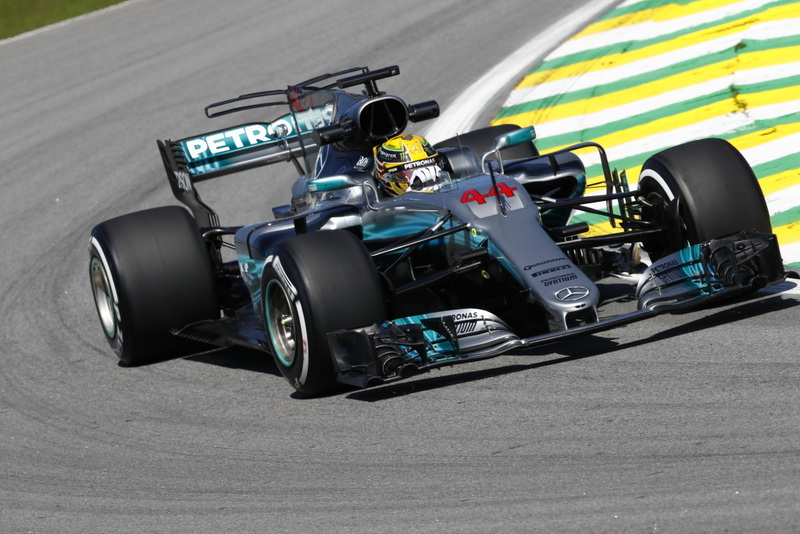 And a brand new power unit for Lewis Hamilton, who, it was being speculated, might be running some 2018 lower burning oil spec parts in anticipation of the rules change for next season. Thus a pitlane start for the man from Mercedes which will at the very least keep him from the usual first lap mayhem and hopefully provide the viewer with a fairly large amount of entertaining racing to boot. 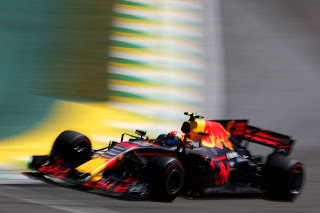 He will be joined at the back by the Toro Rosso lads and the Williams of Stroll, with penalty-palooza fellow sufferer Ricciardo starting further up the grid in the carbon fibre danger zone of P14. The Red Bull v Macca preview with Vandoorne just 2 places higher could also provide some early fireworks, though Stoffel seemed somewhat less than stellar in these tropical environs. Pirelli is on the one stop train today, calling for a one stop switch from Supers to Softs starting around lap 26. Those whose strategy gets ruined could go alternate, with a 2 stop, first 2 stints on the Supers, going 22 laps a piece, and then banging it home with the Softs. 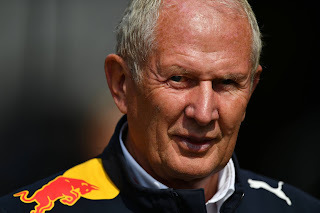 Helmut Marko was out and soothing the waters of what looked to be an incipient fistfight between Franz "the Manic Maniac" Tost and Cyril "I'll Beat 'Em All" Abiteboul in the Toro Rosso- Renault grudge match. Gasly and Hartley had managed to keep their noses clean and the result was they were up to P10 and P12, with Hamilton up to P14 as lap 2 slowly entered the history books and the recovery and clean up began in earnest. Lap 5 saw the SC in and it was time to go racing as a good restart from Vettel, but even better from Massa to get P6 from Alonso. Raikkonen threatened Bottas and Hamilton was hard up against Stroll. Taking advantage of the outside of the same corner that ended his qualifying session, Hamilton was by 2 cars and off in pursuit of Ericsson in P11. Ricciardo despatched Wehrlein fairly effortlessly for P15 as Vettel at the front was purpling the timing screens, taking fast lap and out of DRS from Bottas. Lap 8 saw Lewis ahead of Ericsson and just 10 seconds back of Vettel. Sensing blood in the water, he kept his foot in it and Gasly was his next victim, putting the Mercedes into the points and back into the podium chase. Another lap, another pass as Sainz was the next victim, though he reported some engine issues that were being investigated. But at the front it was Raikkonen quietly doing the work, into DRS of Bottas as Lewis made short work of Hulkenberg. 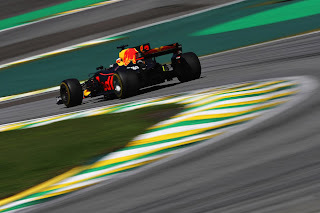 Ricciardo, too, was being quite efficient as he was up to P12 after his first lap adventures. Perez proved to be a more formidable obstacle, and it was almost, but not quite down the front straight on lap 13, meaning another lap of work for the Mercedes man.The following lap, it was again the defense into T1 as Perez covered the inside and Hamilton just hung it round the outside, to take the place. Perez stayed in it through the next turn but was unable to dislodge Hamilton, but not before providing a few shots for the highlight reels. Alonso was next up, but the damage was being done, as Lewis was now 15 seconds back of Vettel. As he asked for this info on the radio, his engineers suggested that Ferrari might be on a different strategy than expected. At the front, Raikkonen had backed off, as his tyres were beginning to cause him issues and Bottas was quietly pacing Vettel, around 2 seconds back as the race began to settle. After a bit of a lull, it was lap 19 that saw Hamilton on the gearbox of Alonso, reeling him in and taking brutal advantage of DRS and diving up the inside of T1 and putting Massa squarely into his sights. "There is a Willams in the back of the Mercedes" cried Nicholls, on the BBC hilariously but presciently transposing team and PU, a bit prematurely though as it turns out it was several more corners for Hamilton to get the job done. Lap 26 saw the start of the predicted pit window, but with the Safety Car having closed things up, the usual gap to the midfield. Lap 28 and regardless, Mercedes pulled the trigger, with Bottas out in between Hamilton and Alonso and the undercut putting pressure squarely on Ferrari. This brought an immediate response and Vettel was in and out, followed by Verstappen as the dominos started following. Just half a second gap for Vettel as he rejoined, but Bottas was unable to keep up and by time they got to the DRS it was more than a second between them, opportunity gone. With the dominos done, it was Hamilton, 4 seconds up on Vettel now leading the way, while Ricciardo, having worked his way past Perez, was in P5, the 2 long runners in amongst the leaders. Raikkonen was the big loser, the gap to Bottas out to nearly 6 seconds, his tyres having taken him out of the scrap at the front before the first pit stop. The pit window for Hamilton lap 33 extended back to Ricciardo, with Perez well out of the way, the question now being how long to go before diving off the Softs. As late as possible would be the classic answer as Vettel, for the moment, seemed happy to circulate at the same pace and conserve for the end of the race. Bottas, by contrast, seemed to be struggling a bit on the Softs, at least early on, as he had dropped nearly 3 seconds to Vettel since he boxed. By lap 38 he was running around the same pace and had stemmed the bleeding, but clearly the Ferrari had some pace in had, whilst the issue was less clear with Valterri. Hamilton's front left was looking dodgier and dodgier, lap after lap, as the chase now seemed to be Sainz chasing down Hulkenberg, with the Toro Rosso of Gasly playing mobile chicane as the Renaults attempted to work their way into the points and gain ground on their WCC rival. Alonso, meanwhile, was firmly fixed on chasing down Massa, as his onboard computer worked out the highest possible finish and then the bone chilling car, as Hartley was instructed to retire the car and the little icicle of fear was stuck deep into the heart of all the teams running Renault PU's. Lap 44 and it was Hamilton into the pits, to set the race into its final stage. Ricciardo followed suit, and it was P5 and back of Verstappen with 10 seconds of free air to roll into before catching up to the Dutchman. The 18 seconds to Vettel seemed a bridge too far, but it was 0.5 seconds in just the first sector that Lewis took and by the end of his first lap on the Supers, nearly a full second was off the gap to P1, with 26 laps to go. The following lap was another second done, while at the front Vettel answered by bringing his pace up, though he couldn't match the lap times being set by Hamilton. Happily enough for Vettel, Lewis wound up getting stuck behind Stroll and dropping some time, as the traffic of the midfield began to play an increasing role in the long chase ahead. 2 seconds was the estimate of damage done, by Hamilton's account. It was back to normal service then, into the mid 1:12's for the chasing Mercedes as Raikkonen was the one turning up the wick, also into the high 1:12's as Bottas got the hurry up from the pitwall. Grosjean was boxed to serve his penalty and as lap 55 turned over, it transpired that 2 penalty points would accompany the time loss for the HAAS driver, a baffling call as from every angle shown it appeared to be nothing more than a racing incident. Bottas had upped his pace per instructions, but it was Alonso who had finally worked his way into DRS on Massa that was the immediate focus. The straight-line speed of the Williams was problematic for the Mclaren, as no matter how close Fernando got, the gap remained unclosed down the straight into T1. Lap 59 and it was Hamilton into DRS and though Verstappen covered off T1, Lewis took his second bite of the apple, and into T4 executed a flawless (though DRS aided) pass. 10 seconds, 11 laps to the front and Raikkonen very much aware of the approaching Hamilton, who, having cleared Verstappen, was into the 1:11's and chunking a second a lap out of the gap to the Ferrari in P3, 4 seconds up the road. Verstappen, having been left behind, was arguing desperately for a second stop to go back to the Supers, as they were much easier to drive. Despite a certain lack of evidence he could make up the time loss, his wish was granted and through the pits he went, back out into P5. Hamilton had halved the gap to Raikkonen during that sideshow. Lap 66 and under a second to Raikkonen as they entered Sector 2. DRS open down the straight, down to half a second as they entered T1 and then a big lockup put a dent in his plans. Not enough to square the tyre, but leaving him too far to finish the move into T4. The following lap it was down to half a second and again a lock up into T1, but he kept it close as they chased down the esses, but again not enough for a T4 pass as Hamilton's tyres were definitely past their prime and the rear of the car was becoming ever more pendulum like as Lewis was desperate to keep it close through the middle sector. As a distraction, Stroll's tyre, about which he had done much complaining since a huge lockup, finally let go at the end of lap 68, and he was forced to limp it back to the pits, down to the carcass. And that was the story, as the last laps headed to the books, Hamilton needed about 3 more laps of tyres to get the job done and claim a podium. Vettel for the win as the checquers fell, followed by Bottas and Raikkonen. 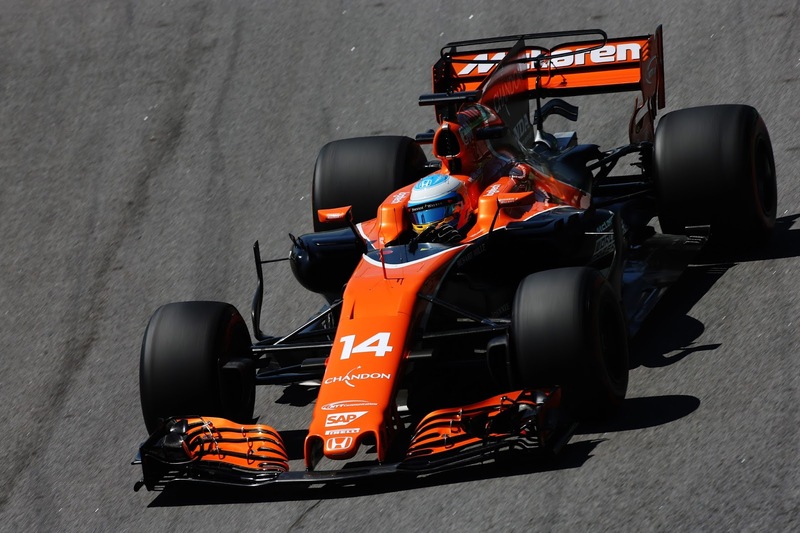 Halfway back the lap, Alonso pulled the trigger and a mad battle for P7 kicked off, and through the middle sector Alonso did all he could, but it was not enough and in his final Brasilian GP, Massa successfully defended P7 as they crossed the line. 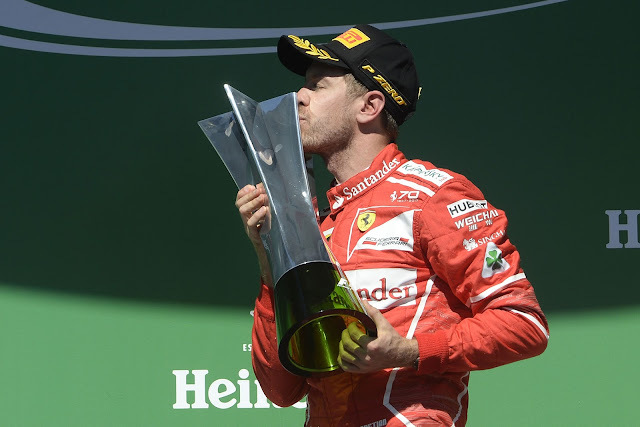 Vettel was pleased enough to toss off some donuts on his way round and the Ferrari win they so desperately needed was put into the books. With Raikkonen's excellent defense of 3rd, it was a Ferrari heavy podium. Questions about Bottas' pace will remain with him, as he was unable to take it to Vettel when the opportunity presented itself. Still, there was room for it to have been much worse and on a blistering hot day P2 and pole position is a clear sign of progress on his side of the garage. The first lap mayhem destroyed the much anticipated race in the midfield, and Ocon, in particular, will have rued the qualifying performance that saw him not making Q3 as it left him in prime position to be a victim of the carbon fibre triangle. Toro Rosso will have been happy enough not scoring any points, as Renault just managed 1 in the form of Hulkenberg leaving a lot of work to be done for Renault to overtake them in the last race of the year. More troubling for Renault, in the form of Viry, will be renewed reliability concerns with yet again another retirement and this despite the engines being run with wider margins after the disastrous results in Mexico. According to Horner, the restrictions costing them 0.2-0.3 seconds per lap and forcing them to burn their tyres trying to make up time in the twisty second sector. It was a lost opportunity by Hamilton, though, that ultimately shaped the narrative of the race as his crash in qualifying set the terms for the penultimate race of the season. Ferrari victory notwithstanding, the lack of their prime opponent at the sharp end of the field ultimately robbed the race of much of its meaning and drama at the front, a lack that was noticeable, despite the heroic charge through the field by Lewis.